In preparation for ship-board flights this spring, the Northrop Grumman Corp.-built MQ-8C Fire Scout will be tested for its ability to operate safely in the intense electromagnetic environment aboard U.S. Navy ships. 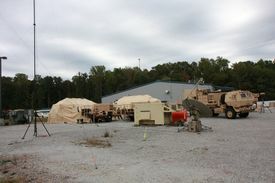 Northrop Grumman Corp. has finished detailed performance testing on its Advanced Pulse Generator (APG), which represents the next technology evolution for the company's Combat Electromagnetic Environment Simulator (CEESIM) product that is used to test and validate the performance of electronic warfare equipment. The U.S. Army and Northrop Grumman Corp. have successfully demonstrated a warfighter-focused, net-centric battle command system for integrated air and missile defense (IAMD). Northrop Grumman Corp. has been selected by the U.S. Navy to conduct a study that explores the replacement of the SPS-48 and SPS-49 air surveillance radars currently on board U.S. Navy amphibious ships and aircraft carriers. The U.S. Navy got its first look at the upgraded MQ-8 Fire Scout unmanned system when Northrop Grumman Corp. delivered its first MQ-8C system this month.